Ajit Pai, the former Verizon lawyer who is chair of the FCC, went too far last Thursday in undermining the Internet when he led the dismantling of net neutrality rules. As a result, he has fueled the energy needed to protect Internet rights. It is time for Movement Judo, where the energy created by the overreach of the FCC is turned into energy not just to overturn the FCC’s decision, but to also create the Internet we need in the 21st Century. 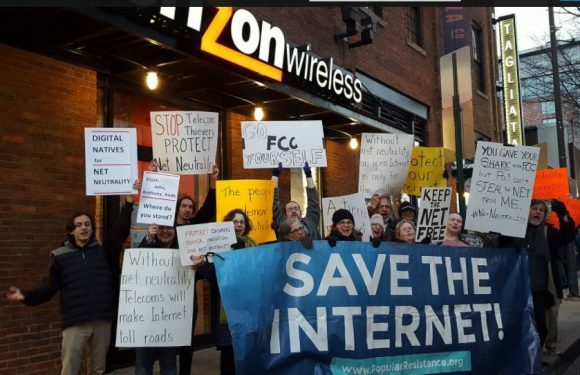 Over the past few months, there has arisen an epic mass mobilization in support of net neutrality and national consensus, with a University of Maryland poll finding 83% support for the Internet being open and equal to all. There was a record number of comments to the FCC on this issue over the summer. More than 1.2 million calls and 12.5 million emails went into Congress through the coalition site, Battle For the Net, and more than 700 protests were held across the country for net neutrality on December 7. The Internet is important to all of us and politicians who do not side with the people will pay a heavy political price. This week, three FCC commissioners gave a handful of mega-corporations the power to control the speed of websites and where we go, what we see and what we pay for access to content on the web. The battle for the Internet is not over – it has just begun, and we will go into next steps to protect our Internet, but first we will start with a bigger question – what should the Internet be in the 21st Century? What Kind of Internet Would You Like to See? If the movement for Internet equality and justice were to put forward a vision for the Internet in the 21st Century, we could make that vision into a reality. We start with the view that the Internet is a key venue for Freedom of Speech. It is a place where First Amendment protections should apply. Political speech should not only be protected in print and television, but it should also be protected in the digital world, including websites, video, social media and new outlets we cannot yet imagine. Political speech on the Internet has been vital in recent years to putting new issues on the political agenda. Video of police violence, sometimes resulting in death, have brought these issues, that have been ignored for years, to the center of political debate. The movement for Black Lives Matter has resulted in prosecution of police, widespread discussion and policy changes; e.g., police wearing cameras, new laws and policies. The occupy encampments that swept the nation in 2011 would not have occurred without the Internet. Early in Occupy Wall Street a small number of people camped out in Zuccotti Park. It was on a weekend march where protesters were arrested and placed behind a mesh barrier by the police that occupy exploded. One high ranking officer went toward the captives and pepper sprayed them. This was caught on camera by multiple individuals and shared on the Internet. When the police tried to claim the protesters were being violent or threatening, the videos showed the opposite to be true. Seemingly overnight, hundreds of occupy encampments sprang up throughout the country. The political meme of the 99% became widespread and the issue of income and wealth inequality became part of the political dialogue. These are two examples of many showing how equal Internet access has become critical to free speech and political development. Part of free speech includes commercial speech and the Internet has been an essential element in new products and services that would not have otherwise reached enough people to support new businesses. This is why outside of the telecoms and cable companies, net neutrality is supported by businesses, especially small start-up enterprises. The Internet has become a basic human right. The Internet is essential to function in modern society. People sign up for health insurance, apply for jobs, do research for school, develop income . . . many activities of life are now conducted online. Universality: Human rights must be afforded to everyone, without exception. People are entitled to these rights by virtue of being human. Currently the Internet does not meet this standard as 39 percent of black, Latino, working-class and people living in rural areas do not have Internet access. Indivisibility: Human rights are indivisible and interdependent; i.e., if a government violates rights it affects people’s ability to exercise other rights such as the right to speak politically, participate in democracy or participate in commerce. Participation: People have a right to participate in how decisions are made regarding protection of their rights. Accountability: Governments must create mechanisms of accountability for the enforcement of rights. Transparency: People must know about and understand major decisions affecting Internet rights. Non-Discrimination: Human rights must be guaranteed without discrimination of any kind. This includes not only purposeful discrimination, but also protection from policies and practices which may have a discriminatory effect. To achieve these principles requires a re-thinking of the Internet. The Internet was created through public investment and Internet access should be a public utility, not controlled by private corporations. Control of the Internet by the public includes community-developed Internet, municipal Internet or even nationalizing the Internet. Current rules blocking municipal ownership need to be reversed. Twenty-one states prevent or discourage the construction of public broadband networks. If there is corporate involvement in the Internet, monopolies should be prevented and corporations should be regulated so that human rights principles are not violated.Profiteering from the Internet has currently reached grotesque proportions, with Charter’s Tom Rutledge the highest paid CEO at $98.5 million in 2016, and this will worsen without net neutrality. We already know the parameters of what we need. Jimmy Lee, an investor and adviser in socially minded start-ups, writes, a”forward-looking agenda must focus on expanding digital access and participation. We cannot build a more equal America, or a future with greater opportunity and economic mobility, if large numbers of Americans are stuck on the wrong side of a growing digital divide.” Everyone needs a free or affordable pathway to high-speed internet access. It is time to develop national consensus on what we want the Internet to be in the 21st Century. What are the key principles or services needed? Comment on our Facebook page and discuss it in your own communities, organizations and Internet spaces. After we develop consensus, we must work to make it a reality. Movement educator and author Rivera Sun describes how the Internet is as ubiquitous as salt was during British rule of India. When Gandhi began the salt march protest of the British monopoly over salt, no one expected it would bring down the British empire. Our fight for the human right to Internet access could be a key boomerang in response to the extremism of corporate power and the Trump era. People outside of the FCC on the December 13th, the night before the FCC vote. Some spent the night camping out in freezing cold temperatures. 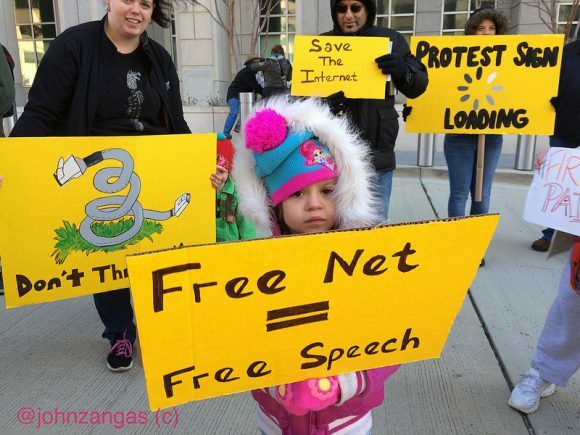 The mobilized movement for net neutrality will do all it can in court, Congress and the streets to make sure the FCC decision against net neutrality does not stand. The outcome at the FCC was no surprise as Chairman Pai made false and inaccurate claims over the past year against net neutrality. What is a surprise is how strong the movement for Internet equality became in response to his extremism. The task of the movement now is to turn that energy into political power. We must continue to stay active, involve more people and build the movement we need for an Internet that serves the people. This week’s 3-2 vote of the FCC was a dramatic break with the history of the free and open Internet. The Internet has always been a common carrier where net neutrality rules and practices have always existed and were protected by commissioners from both parties. The former Chairman, Tom Wheeler, put rules in place in 2015 that codified net neutrality practices and gave the FCC the power to enforce those rules. Ajit Pai dismantled the 2015 rules, and abdicated FCC authority over internet service providers, clearing the way for blocking, throttling, discrimination and profiteering by the nation’s largest phone and cable companies. The first battleground for the people will be the Congressional Review Act, which allows Congress to pass a resolution of disapproval and reverse a decision by a federal agency. Congress must act with a majority of votes in both chambers and must do so within 60 legislative days — which is likely to take four to six months. The job of the movement is to demand that the representatives in the House and Senate reverse the FCC. Call Congress here. Now that a movement has been created around net neutrality, the people-powered campaign needs to define what it wants and fight for it. We have the power to make sure that every person running for office in 2018 and 2020 stands with the people by treating the Internet as a human right where people have equal access to high quality and low cost Internet service. Just as we did in our campaign to stop the Trans Pacific Partnership, which at first seemed unstoppable, we need to make sure everyone running for office stands with the people on the Internet. While both parties receive a great deal in donations; e.g., in the 2016 election cycle, the telecom industry donated heavily to Democrats, contributing a record $16.1 million to their campaigns and contributing $9.2 million to Republicans, people power can overcome the power of money. We saw with the mobilization around the FCC, millions are willing to take action. In addition, millions of small businesses will be hurt by the FCC ruling. Start-up businesses spoke up against it as did much of Silicon Valley and tech companies. Our movement is a broad one, which includes political activists, businesses, local governments, actors, musicians and artists as well as religious groups. The movement also needs to work at the local level urging municipal broadband or even communities creating their own Internet. We need to break the regional monopoly control held over access to the Internet by a handful of companies. Another immediate battleground will be in the courts. Nearly 20 state attorneys generals have announced they will sue the FCC over their decisions to repeal Title II net neutrality rules and to prevent state’s from taking action to protect net neutrality. Free Press and other nonprofit organizations will also sue. Multiple strong cases will be presented that argue the FCC was arbitrary, capricious and abused its discretion and violated the Administrative Procedures Act, especially since so many of the arguments made by the FCC were flawed and factually inaccurate, built on lies and showed a lack of understanding of the Internet. An unusual issue is likely to be the flawed public comment period. Pai promised to end net neutrality before the comment period began, making it a phony process, and the FCC did not remove millions of false comments made by bots. Pai refused to work with the New York attorney general investigating these abuses. One of the early decisions the court will be asked to make is to stop the FCC decision from taking effect. A ruling on a preliminary injunction, never easy to get, seems to meet the legal standards in this case. Of course, a lot will depend on the inclinations of the judge assigned to the case. Litigation will continue through all of 2017 and into 2018, but the movement should not put all of its hopes into lawsuits. We need to continue to build the movement and make this a political issue that cannot be ignored. Net Neutrality protest in Baltimore. One of more than 700 held on December 7, 2017 the Internet day of action. Former FCC commissioner, Michael Copps, wrote: “Ajit Pai and his majority are turning their backs on the millions of Americans who fought for years to win strong net neutrality. This naked corporatism is Washington at its worst.” We know that if the people continue to mobilize and demand Internet justice, then Pai will not be the last word. We share their optimism. The people’s response to threats to the Internet has been consistently powerful. Now we need to take power away from the political whims of appointed commissioners, take democratic control of the Internet and define the Internet we want for our future and for future generations. Ajit Pai may not realize it yet, but his abuse of power has awakened an Internet giant. Join our Protect Our Internet campaign so you can stay informed about this issue and actions. This is a multi-year campaign and we need your help to build it. Listen to our next Clearing The FOG Radio show, the first one produced in our new Popular Resistance studio, which will focus on net neutrality and the campaign for the Internet we need for the 21st Century. This article was posted on Sunday, December 17th, 2017 at 2:17pm and is filed under Activism, Censorship, Freedom of Expression/Speech, Human Rights, Internet, Net Neutrality.